The startup funding requirements of most new businesses follow a similar pattern. The purpose of the cash flow statement in the financial projections of the business plan is to show the pattern and the peak funding requirements so that the best method of financing can be identified. The startup funding requirements can be highlighted by plotting the cash flow from the cash flow statement on a cumulative basis over time. A typical graph is shown below. 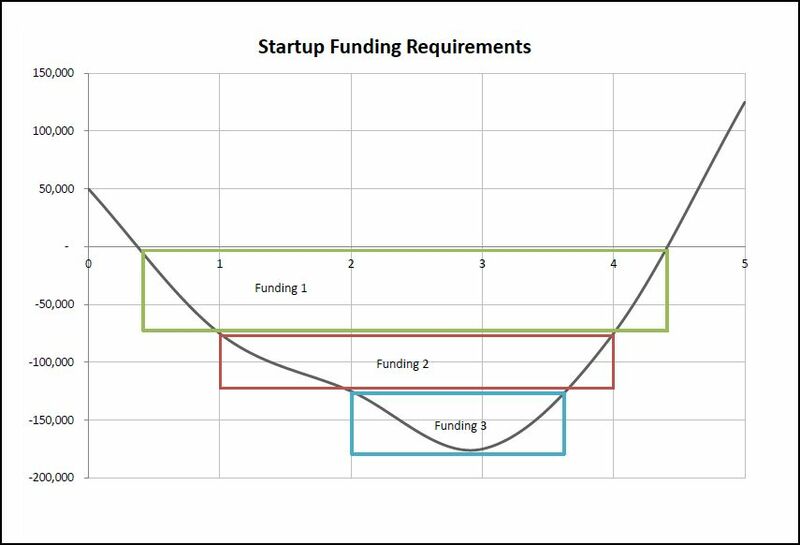 The shape of the startup funding requirements graph is often referred as the j curve or death valley curve, as to survive its first few years, the business needs to find sufficient financing to cover the period where the cumulative cash flow remains negative. The business normally starts off with cash being injected by the owner, in this case 50,000 shown at year 0. Over the next few years, with minimal revenue coming in, net cash flows out of the business until the startup funding requirements reaches a peak, shown in the example as 175,000 at year 3. Eventually, net cash starts to flow into the business as the initial high expenditure slows down and revenue increases, until the cumulative cash flow starts to go positive, in this case towards the end of year three. At this stage, the business could simply borrow the peak funding requirement of 175,000 for the term required of 4.5 years. This would ensure adequate facilities are available to cover the planned development. However, doing this would result in unnecessary high interest charges, as the peak facility is not required for the full term. Using the cumulative cash flow graph, the startup funding requirements can be split into manageable tranches (shown in the example as the highlight boxes, funding 1, funding 2, and funding 3). In this particular case instead of 175,000 for 4.5 years, the business could operate with the following funding profile. The effect of organizing the funding in tranches results in a significant reduction in the interest paid on the facilities. In the above example, ignoring the effect of compounding which would make matters worse, the simple interest on 175,000 for 4.5 years at say 6% is 47,250. However, using the three tranches of funding, the interest is reduced to 34,500, a saving of 12,750. The cumulative cash flow graph is a useful tool for identifying the pattern and peak funding needed by a startup business. Using the graph, the startup funding requirements can split into funding strips to ensure the business has the correct level of finance available for the minimum period of time.